I knew it was going to be a good day when I woke up Monday morning, after a great night’s sleep, and had an amazing cup of coffee! 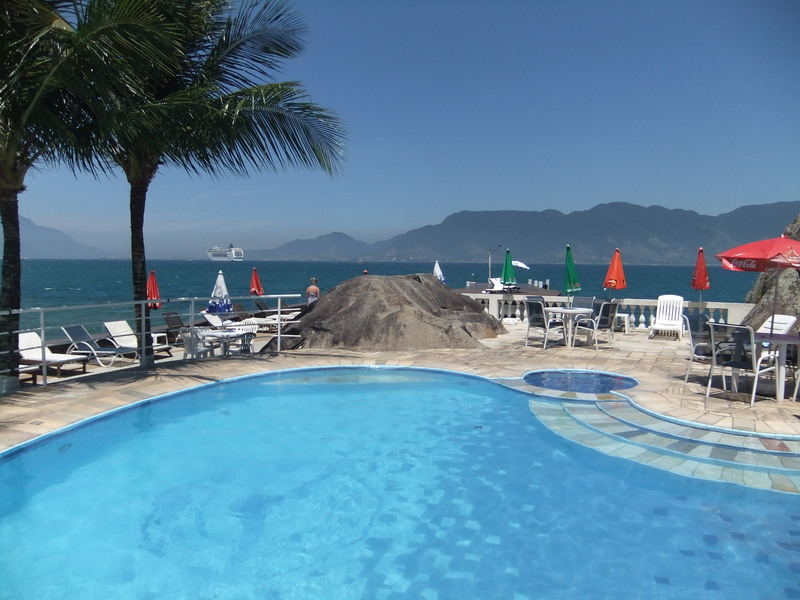 We were off to the Ilhabela to stay at my friend Anna’s hotel for a few days. Anna has been unconditionally helpful to us on the trip so far. She has booked us flights, phoned hostels, and put up with my endless emails asking her to translate Portuguese so I can organize Carnaval accommodation. On top of all that, she is the manager of an amazing 4 star hotel, called Hotel Mercedes, on an island off the coast of Brazil, and has reserved us a room for the week! The morning continued successfully when we arrived with perfect timing to the bus station. We got our tickets for a cheaper price than expected, and I finally found a dress that I had long been searching for (at 50% off, might I add). 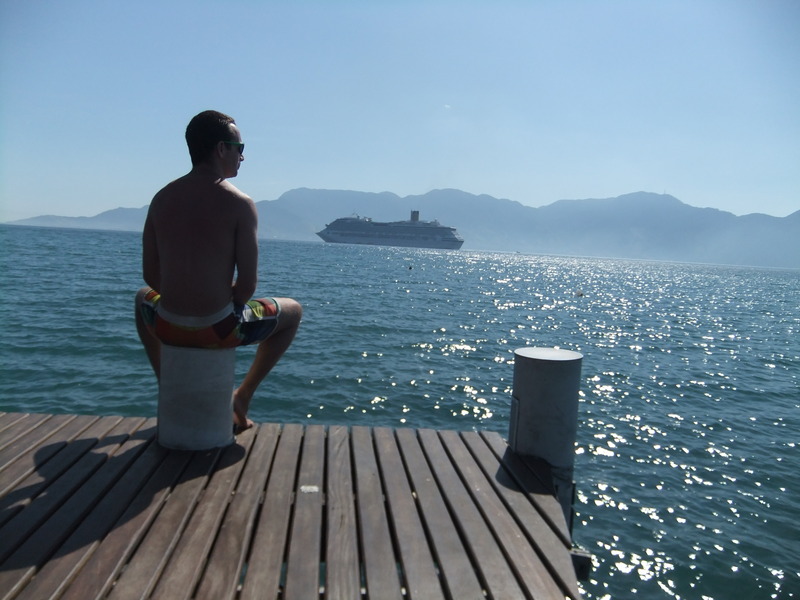 It took us about 4 hours to get to the island, including the quick 15 minute ferry from Sao Sebastio. We easily found a cab that took us right to the hotel, and was greeted by a bellboy who grabbed both our bags to take to reception. We already realized we were outside our comfort zone. There’s no way we are classy enough for a place like this. It is absolutely unbelievable. As I told Anna, I could have slept on one of the couches in the lobby and been on cloud nine! Adam and I decided the place was medieval castle meets Caribbean luxury resort! A unique combination of stone walls and large, dark wood furniture combined with modern looking white and blue accent pieces and splashes of bright tropical color. The place has it’s own private beach and bar with a swimming pool, a long dock with a plethora of sun chairs and a refreshing breeze! We checked into the hotel, and the bellboy brought us, and our bags, through the hotel to our room. 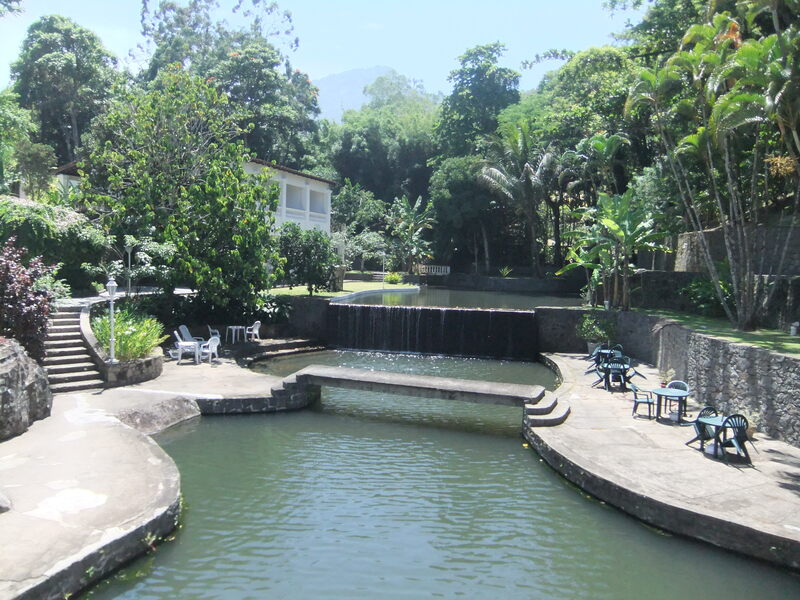 It is quite a walk through the place; we passed a large common room with a huge 52″ TV in it, a reading room with tables and chairs to relax in, and walked over a small river with waterfalls that runs right through the middle of the grounds. We were escorted up to a floor that needed a special key just to get on to, walked to the end of the hall, and was led in to our suite… OH MY GOD! This is hands down the nicest place I’ve ever stayed in. We had the most VIP suite in the entire hotel. Our bathroom alone was bigger than my bedroom at home, with a his and her sink, a two person Jacuzzi, a walk-in shower that could fit 11 people (Adam at 6′ could lie down in the shower and have a good foot and a half to spare before touching the walls!). Our bedroom had a 46″ plasma TV in it, a two person couch that sat in front of a king sized bed, a fully stocked mini fridge, a lounge chair and a whole desk area full of stylish magazines. Our deck, which was on the corner of the building, looked out towards both the ocean, and across the property. We had a little glass table with chairs for a morning coffee, or a crib tournament in the evenings, and a big round lounge chair to curl up and watch the sunset (my favourite place in the room). We were absolutely floored by the place! Anna, if you’re reading this, you are an angel. You have outdone yourself, so thank you to you, Stefano and to your family sooooo much! After settling into our room, we went down to the pool for a swim. The pool was like bath water and was a perfect way to unwind, watch the sunset and nibble on a bruschetta appy! We then walked around the area checking out the neighboring beaches and the nearby restaurants (we definitely have the nicest beach area). Then afterwards, off to town for dinner! This is the first time on our trip that I actually look like a girl! With the dress I bought earlier and the fact that there is a shower with pressure AND a hairdryer in our room, I actually managed to look presentable for dinner! So we bussed into town and found a lovely restaurant with live music and a great atmosphere. We shared a large fish dish that was delicious. This was also the first time we’ve ordered seafood on the trip, so that made me happy. After dinner we stocked up on beers, and the mixes needed for delicious caipirinhas, and headed back to the room for another crib tournament. The next morning, after an amazing sleep in our air-conditioned room and king-sized bed, we went to breakfast. For breakfast we were spoiled again. It was served, buffet-style, in a giant hall and had everything under the sun: fresh fruits and pastries, rolls, croissants, cereal, frittatas, coffees, juices, various meats and cheeses and two whole tables of desserts! There was apple crumble, chocolate cake, cheese cake and so many more! This is definitely a change from the stale bun and dolce de leche we have been getting at our hostels, so we took FULL advantage of the feast! But after breakfast, you’ll be sad to hear, our day got very stressful. We went out to the dock, set up lounge chairs and umbrellas, grabbed some icy beers and homemade caipirinhas and sat there for 6 hours. 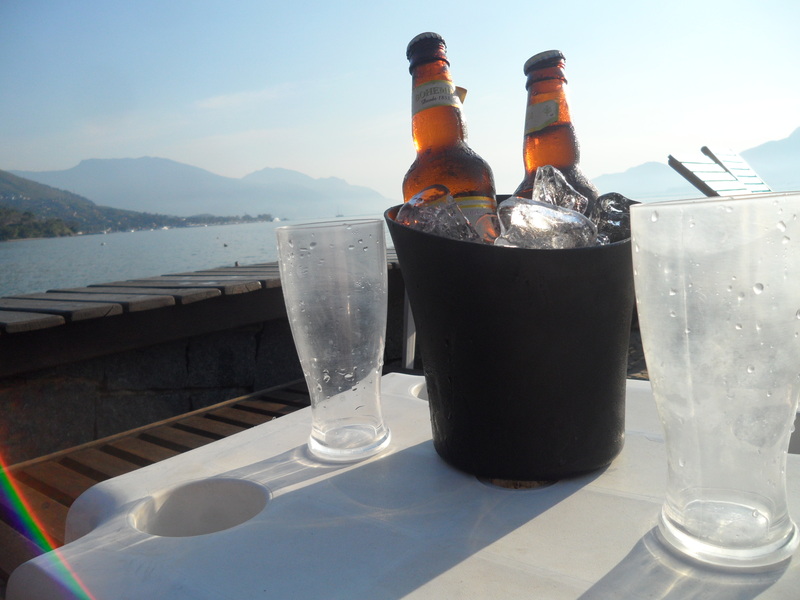 Decision-making was difficult… Should I hold my beer in my left hand, and have the breeze blow cold condensation on my stomach, or in my right hand where it is more difficult to write my blogs? Should we listen to Matchbox 20 or Third Eye Blind on Adam’s speakers? It’s frustrating that the beautiful cruise ships are in the way of my otherwise uninterrupted view of the mainland mountains. It’s equally upsetting that I can’t spend the afternoon picking out shapes in the clouds… because there aren’t any. Should I tan my back, or my front? Read or listen to music? Swim in the ocean or the pool? Luckily I don’t have to worry about going to the bar for beer, or keeping track of money, because the bar staff will bring everything out to us, and just charge it to the room… But that’s really the only thing we have going for us. Either way, after 6 hours in the sun, even with sunscreen, I was a lobster from head to toe! We’d been drinking steadily in the sunshine for several too many hours and I needed to go inside. So back up to our suite we went! Sadly, once we got there, we missed being at the pool, so we decided, in our inebriated state, to have our own pool party! I honestly don’t think it is humanly possible for any other male / female duo to make this honeymoon suite LESS romantic than Adam and I did. 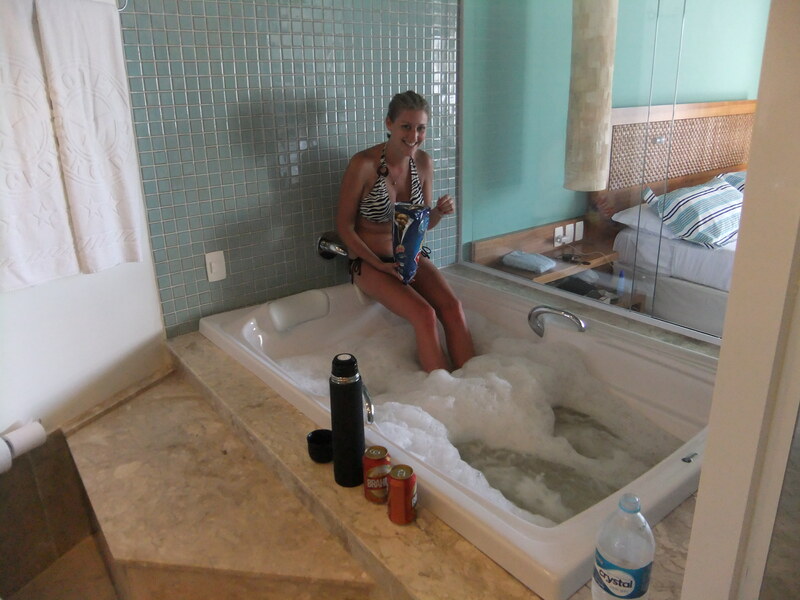 We first filled our two-person Jacuzzi tub with icy cold water (to ease my burn) and added Adam’s laundry “camp suds” detergent to make tonnes of bubbles. Then we grabbed a family sized bag of Ruffles chips, cracked a couple more beers and belted out, old school Third Eye Blind songs (with the speakers on full blast) for the better part of 2 hours. We then high-fived at the realization that we were probably the only people to have ever done this in such a VIP suite. Once again, clearly not classy enough for a place like this. After the Jacuzzi party, we headed back into town for dinner. We went back to the same restaurant, since they had amazing deals on food before 8pm. Our two main problems for the evening were money and sunburns. We had just enough cash on us for dinner, some after-sun lotion, a case of beer and the bus home with 3 dollars to spare, and so, Adam ran to the bank during dinner to get cash. Unfortunately that particular bank would not work with either of our cards. So after dinner, we went to the only other bank in town; BOTH machines were out of order. Great. Even with our limited funds, my sunburn was stinging so badly that I stopped in the pharmacy to grab some aloe. I couldn’t see any on the shelf, so tried to ask the man behind the counter. I did one of those “I don’t know your language, so I’m going to attempt to describe my issue via charades” act… The man handed me hemorrhoid cream. Clearly I’m not cut out for charades. Turns out, the cream was ALSO useful for sunburns, but no one mentioned that it will also turn your skin a streaky beige colour. At this point I would have tried anything: so I buy the lotion. Then we wait at the bus stop, I’m covered in hemorrhoid cream from head to toe, and we have a combined total of $3 to our names. The bus comes and we jump on. Turns out, this is the turn around point for this bus, and we start going in the wrong direction from our hotel. The stop buttons aren’t working, and we don’t know where we are going, so, 4km in the wrong direction, when the bus makes its first stop, we jump off. Now we have $2 to our names, we are in the middle of nowhere on a random island, and I am STILL covered in hemorrhoid cream. Luckily, within a couple minutes, a bus drives by; we chase it down and cross our fingers it’s going where we need to go. It does! We head up to the room, I take an Advil and try to sleep while Adam watches a movie in Portuguese. Rough day in paradise. The next day we decide to do nothing again. Breakfast in the morning, beach in the day! Only this time Adam won’t let me in the sun. So I am forced to stay in the shade of an umbrella and sulk while I watch everyone play in the sunshine. It is, however, another perfect day. Cool breeze, flying fish jumping out of the water on all sides of us, big turtles coasting through the waves, and a perfectly sunny afternoon! We once again sit for hours reading, lounging, and sipping on cool beverages: a much-needed vacation after a month of travel. Honestly, traveling is tough! At the end of the day, we are much more relaxed, albeit still broke. The ATM’s were still out of service, so we decide to leave the issue for “mañana” – such a South American mindset already! 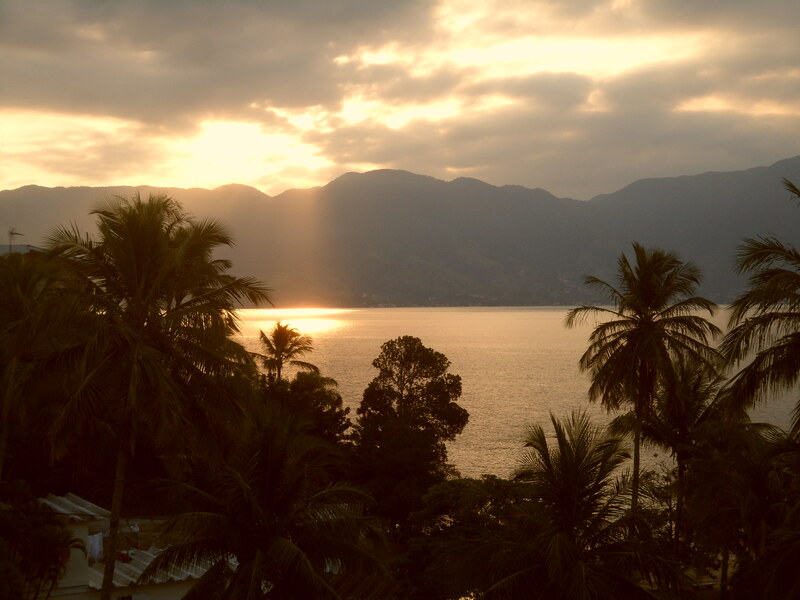 When mañana arrives, we head to the big town of Ilhabela to find a working bank machine. It’s our major excursion for the day, and after three days of nothing this seems like an impossible task. But we guess the bus system correctly this time, so the trip is fairly straightforward. I even find some real aloe vera at the supermarket! Then back to the beach (where I’m again banned from the sun) to await Anna’s arrival! 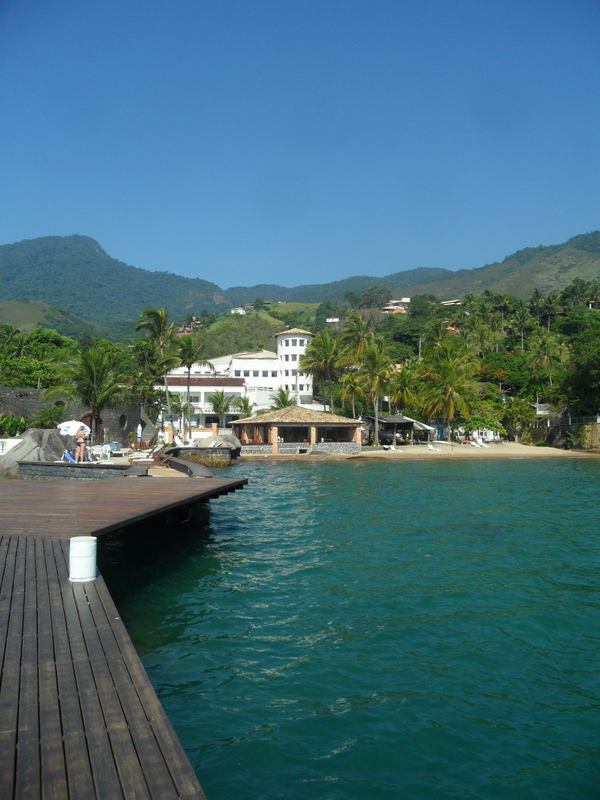 This entry was posted in Brazil, South America and tagged Brazil, Hotel Mercedes, Ilhabela, Paradise, Travel by hilarylust. Bookmark the permalink.